I know how important it is to properly maintain a pair of running shoes, making sure to change them out every three months or 300 miles. I try to regularly inspect my soles to make sure rocks, nails or other debris isn't stuck in the treads. I always take note of unusual wear and tear on the shoes, as that is potentially a sign of an improper fit. Yesterday, I was busted for not practicing what I preach. I've reincorporated spin classes during my training over the past month; however, since I don't own cycling shoes, I wear my usual running trainers that I always have in my car. Yesterday after a rigorous class at my gym, I noticed that my shoes felt weird. When I went to take them off, I saw my little toe poking out on the left side, and a matching tear was forming on the right. My shoes had unanimously decided that it was time to call it quits. It was the wakeup call I needed to purchase replacements. I couldn't remember how long I had the shoes, but remembered this was the first pair I purchased after changing to a new brand. I could date the purchase by looking back at this post, where I expressed the importance of visiting your local running store to ensure a proper fit. That article was published in September. I had spent 8 months on that same pair of shoes. What's worse is that I calculated the number of miles that had been covered in that timeframe, and the races alone totaled up to four full marathons, five half marathons, four 10K's, five 5K's, a 10 Miler, and an 8K. Not including the training miles I laid down, the sum was already close to the suggested 300. It's embarrassing to admit how much I slacked on replacing these shoes, but it's a great opportunity to revisit the importance of protecting the most valuable asset a runner has; their legs and feet. By getting properly fitted at a running shoe store and making a solid investment, I was able to extend the lifespan of my footwear and hopefully my running career. - Get a proper fit at a local specialty running shoe store. - Inspect your treads regularly for wear and tear. - If possible, own two pairs of shoes to rotate, especially on back-to-back training days. - In Sharpie, mark the heel of your shoes (on the back, not the bottom) with date of purchase. - When in doubt about the fit or wear on your shoes, ask questions! - Wear different shoes for running and cross training. Your shoes are your first line of protection from injury, so making sure they are in top notch condition is a priority. 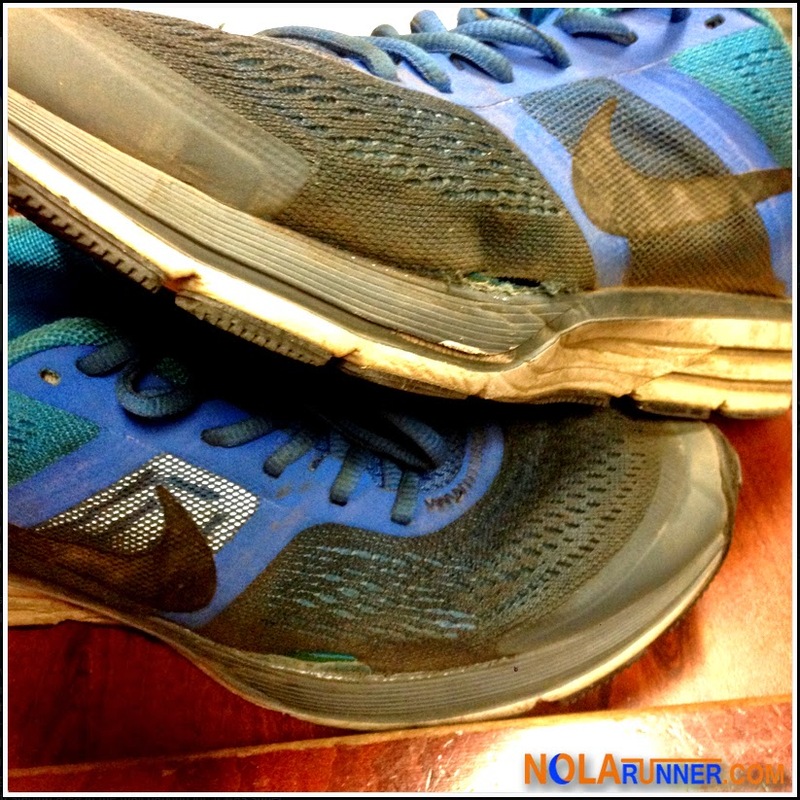 Have you found any other tricks to protect the integrity of your running shoes? I'd be interested in getting feedback in the comments below.